Think you got ripped off by Santa because you only got socks and underwear for Christmas? Kijiji has the answer: get yourself some mutha-scrubbin' SOAP, G! This is the OG beauty bar. 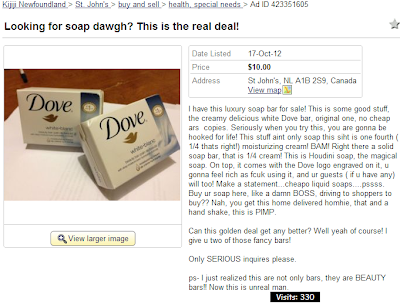 Looking for soap dawgh? This is the real deal! I have this luxury soap bar for sale! This is some good stuff, the creamy delicious white Dove bar, original one, no cheap ars copies. Seriously when you try this, you are gonna be hooked for life! This stuff aint only soap this siht is one fourth ( 1/4 thats right!) moisturizing cream! BAM! Right there a solid soap bar, that is 1/4 cream! This is Houdini soap, the magical soap. On top, it comes with the Dove logo engraved on it, u gonna feel rich as fcuk using it, and ur guests ( if u have any) will too! Make a statement...cheapo liquid soaps....pssss. Buy ur soap here, like a damn BOSS, driving to shoppers to buy?? Nah, you get this home delivered homhie, that and a hand shake, this is PIMP. Can this golden deal get any better? Well yeah of course! I give u two of those fancy bars! ps- I just realized this are not only bars, they are BEAUTY bars!! Now this is unreal man.